Growing up, there’s an idea that often gets perpetuated. That time equals money. The fact is, time is far more valuable than money. And there are ways to make money that don’t necessarily take time. So don’t bill by the hour. Find ways to add lots of value immediately. It’s easy to observe. It’s easy to scroll through the Facebook news feed or turn on the television. It’s easy to sit by and watch and consume what other people create. In fact, the creators want us to consume what others are creating. That’s how they make money. But we were meant to be creators. If you ask kids in preschool how many of them are artists, every one of them will raise their hands. If you ask kids in the sixth grade how many of them are artists, only a couple brave ones will. What happened? We’ve been taught to observe. But today, I’m committing to create. If you are struggling with a problem, chances are you need to simplify it. Things naturally breed complexity. Atrophy is real and complexity builds on itself. Embrace the complexity, but seek simplicity. The challenge is knowing when to simplify. Simplify too soon, and you’ll miss something important. Simplify too late and you’ve missed some key opportunities. Decide if you have the info you need to simplify. If you have the information, do it. Recently I had the opportunity to sit down across from a fighter. Not a boxer or MMA fighter, but a fighter in life. This man was a product of hardship through and through. He is ex-military, raised two kids on his own, battled drug addictions, and just finished a nasty bout with cancer. But this guy loves Jesus. Loves Jesus like crazy. He has fought the fight for the last 50 years. He is fighting the fight anew every day. So no matter what your fight is today, keep fighting. Fight for good. Fight for endurance. Fight for justice. Fight for community. Fight for love. No fight is too big. Everyone else is fighting too. There’s a distinct difference between those who are good at something and those that aren’t. I see this all the time in marketing. There are people who are really good at checking off boxes on a to-do list or at looking busy for their boss, but don’t drive real returns. Many careers allow these people to continue to exist. If you want to make a difference, get good at something really valuable. Not just better than average, but WAY better than average. Commit to make it work. Dig in with both feet. Endure the struggle. On the other side is success. Most people aren’t really good at their jobs. If you can get good, you can make a difference. It’s not about your passion. It’s about finding something to get really good at. If you do that, that thing often becomes your passion. I used to think it was talent was the most important thing for success. Now I’m convinced hustled is the most important thing. Talent can’t be controlled. Hustle can. Talent is good. Hustle is better. But like peanut butter and jelly, they are best together. It’s easy to criticize. It’s easy to take cheap shots in a tweet or on social media. It’s easy to be snarky or sarcastic. It’s easy to play armchair quarterback. It’s easy to launch drive by insults. We do it all the time – against celebrities, politicians, friends, and strangers. Stop. Get to know someone. They will be just fine without your commentary. Forget the drive by. Ask them to take a ride with you. Lately, it seems best to keep my mouth shut. There are always opportunities to say inflammatory things. It’s easy to spout opinions. It’s easy to want to be right or to argue. It’s easy to talk. Listening is hard. With all the conversations around politics (and any other controversial topic), it’s easy to want to speak. And I do so more than I should. In fact, I have a blog post in draft mode for this blog that you’ll never see. It will never get published. Because sometimes it’s just better to keep your mouth shut. Why cause conflict when we’re not going to do anything positive? I’m not at all afraid of conflict. But it also isn’t helpful to cause conflict if you’re not going to change anything. So maybe try keeping your mouth shut. I’m trying it. It’s making my life better. Decide to listen more. Talk less. You never know what you’ll learn. There are literally thousands of lessons from trying to start and run a company. I’ve learned more in the past 5 months than I have at many other points in my entire life. One of the lessons that has been a theme for me over the past year and a half is persistence. I used to be really bad at being persistent. If I didn’t get results, I’d give up. If I didn’t feel like doing something, I’d give up. When things got hard, I’d give up. But giving up never really gets you anywhere. The difference between the people who make a different and those who don’t is largely due to persistence. At least we’ll put it this way: If you’re not persistent, you won’t make an impact. If you are persistent, you have a chance. But there is also some wisdom. There are things being worth persistent about. And there are things that aren’t. Figure out what things are worth pursuing, and then don’t give up. Be persistent. Let everything else go. Seth Godin talks about The Dip. The Dip is the point in any venture where it gets hard. 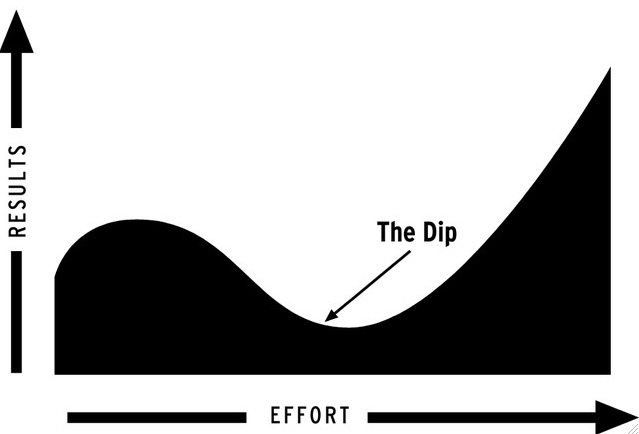 The Dip is when effort doesn’t seem to be getting results. It’s the point where most people quit. And The Dip is real. I know because I’ve spent time there. In some areas of my life I’m spending time there now. This is my second season on a snowboard. I’m in The Dip. Five months ago I went full-time with Analytive. I’ve been in The Dip. At various other point in my life from programming, to marketing, to dancing, to guitar playing, I’ve spent time in The Dip. But getting out of The Dip is what matters. Pushing through when things aren’t going well. Keeping the pedal to the floor when the tires just seem to be spinning. And in just the past few months I’ve talked to some companies that have given up. They’ve thrown in the towel on growth or even the whole business. They settled down to get jobs somewhere else. They didn’t survive The Dip. The truth is, you have to decide whether you are going to push through The Dip before you even start. Otherwise, it’ll be way to easy to give up. So before you decide to snowboard, start a business, or learn a language, you must ask: Are you willing to push through The Dip? If the answer is no, don’t even start. If the answer is yes, then let’s go.